Electron paramagnetic resonance (EPR) or electron spin resonance (ESR) spectroscopy is a method for studying materials with unpaired electrons. The basic concepts of EPR are analogous to those of nuclear magnetic resonance (NMR), but it is electron spins that are excited instead of the spins of atomic nuclei. EPR spectroscopy is particularly useful for studying metal complexes or organic radicals. EPR was first observed in Kazan State University by Soviet physicist Yevgeny Zavoisky in 1944, and was developed independently at the same time by Brebis Bleaney at the University of Oxford. Therefore, the separation between the lower and the upper state is for unpaired free electrons. This equation implies that the splitting of the energy levels is directly proportional to the magnetic field's strength, as shown in the diagram below. An unpaired electron can move between the two energy levels by either absorbing or emitting a photon of energy such that the resonance condition, , is obeyed. This leads to the fundamental equation of EPR spectroscopy: . Experimentally, this equation permits a large combination of frequency and magnetic field values, but the great majority of EPR measurements are made with microwaves in the 9000–10000 MHz (9–10 GHz) region, with fields corresponding to about 3500 G (0.35 T). 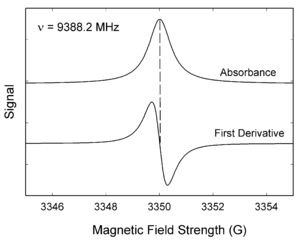 Furthermore, EPR spectra can be generated by either varying the photon frequency incident on a sample while holding the magnetic field constant or doing the reverse. In practice, it is usually the frequency that is kept fixed. A collection of paramagnetic centers, such as free radicals, is exposed to microwaves at a fixed frequency. By increasing an external magnetic field, the gap between the and energy states is widened until it matches the energy of the microwaves, as represented by the double arrow in the diagram above. At this point the unpaired electrons can move between their two spin states. Since there typically are more electrons in the lower state, due to the Maxwell–Boltzmann distribution (see below), there is a net absorption of energy, and it is this absorption that is monitored and converted into a spectrum. The upper spectrum below is the simulated absorption for a system of free electrons in a varying magnetic field. The lower spectrum is the first derivative of the absorption spectrum. The latter is the most common way to record and publish EPR spectra. For the microwave frequency of 9388.2 MHz, the predicted resonance occurs at a magnetic field of about = 0.3350 teslas = 3350 gausses. where is the number of paramagnetic centers occupying the upper energy state, is the Boltzmann constant, and is the thermodynamic temperature. At 298 K, X-band microwave frequencies ( ≈ 9.75 GHz) give ≈ 0.998, meaning that the upper energy level has a slightly smaller population than the lower one. Therefore, transitions from the lower to the higher level are more probable than the reverse, which is why there is a net absorption of energy. where is a constant, is the sample's volume, is the unloaded quality factor of the microwave cavity (sample chamber), is the cavity filling coefficient, and is the microwave power in the spectrometer cavity. With and being constants, ~ , i.e., ~ , where ≈ 1.5. In practice, can change varying from 0.5 to 4.5 depending on spectrometer characteristics, resonance conditions, and sample size. A low temperature to decrease the number of spin at the high level of energy as shown in Eq. 1. This condition explains why spectra are often recorded on sample at the boiling point of liquid nitrogen or liquid helium. An unpaired electron can gain or lose angular momentum, which can change the value of its g-factor, causing it to differ from . This is especially significant for chemical systems with transition-metal ions. The magnetic moment of a nucleus with a non-zero nuclear spin will affect any unpaired electrons associated with that atom. This leads to the phenomenon of hyperfine coupling, analogous to J-coupling in NMR, splitting the EPR resonance signal into doublets, triplets and so forth. Interactions of an unpaired electron with its environment influence the shape of an EPR spectral line. Line shapes can yield information about, for example, rates of chemical reactions. The g-factor and hyperfine coupling in an atom or molecule may not be the same for all orientations of an unpaired electron in an external magnetic field. This anisotropy depends upon the electronic structure of the atom or molecule (e.g., free radical) in question, and so can provide information about the atomic or molecular orbital containing the unpaired electron. This last equation is used to determine in an EPR experiment by measuring the field and the frequency at which resonance occurs. If does not equal , the implication is that the ratio of the unpaired electron's spin magnetic moment to its angular momentum differs from the free-electron value. Since an electron's spin magnetic moment is constant (approximately the Bohr magneton), then the electron must have gained or lost angular momentum through spin–orbit coupling. Because the mechanisms of spin–orbit coupling are well understood, the magnitude of the change gives information about the nature of the atomic or molecular orbital containing the unpaired electron. In general, the g factor is not a number but a second-rank tensor represented by 9 numbers arranged in a 3×3 matrix. The principal axes of this tensor are determined by the local fields, for example, by the local atomic arrangement around the unpaired spin in a solid or in a molecule. Choosing an appropriate coordinate system (say, x,y,z) allows one to "diagonalize" this tensor, thereby reducing the maximal number of its components from 9 to 3: gxx, gyy and gzz. For a single spin experiencing only Zeeman interaction with an external magnetic field, the position of the EPR resonance is given by the expression gxxBx + gyyBy + gzzBz. Here Bx, By and Bz are the components of the magnetic field vector in the coordinate system (x,y,z); their magnitudes change as the field is rotated, so does the frequency of the resonance. For a large ensemble of randomly oriented spins, the EPR spectrum consists of three peaks of characteristic shape at frequencies gxxB0, gyyB0 and gzzB0: the low-frequency peak is positive in first-derivative spectra, the high-frequency peak is negative, and the central peak is bipolar. Such situation is commonly observed in powders, and the spectra are therefore called "powder-pattern spectra". In crystals, the number of EPR lines is determined by the number of crystallographically equivalent orientations of the EPR spin (called "EPR center"). Since the source of an EPR spectrum is a change in an electron's spin state, it might be thought that all EPR spectra for a single electron spin would consist of one line. However, the interaction of an unpaired electron, by way of its magnetic moment, with nearby nuclear spins, results in additional allowed energy states and, in turn, multi-lined spectra. In such cases, the spacing between the EPR spectral lines indicates the degree of interaction between the unpaired electron and the perturbing nuclei. The hyperfine coupling constant of a nucleus is directly related to the spectral line spacing and, in the simplest cases, is essentially the spacing itself. Two common mechanisms by which electrons and nuclei interact are the Fermi contact interaction and by dipolar interaction. The former applies largely to the case of isotropic interactions (independent of sample orientation in a magnetic field) and the latter to the case of anisotropic interactions (spectra dependent on sample orientation in a magnetic field). Spin polarization is a third mechanism for interactions between an unpaired electron and a nuclear spin, being especially important for -electron organic radicals, such as the benzene radical anion. The symbols "a" or "A" are used for isotropic hyperfine coupling constants, while "B" is usually employed for anisotropic hyperfine coupling constants. In many cases, the isotropic hyperfine splitting pattern for a radical freely tumbling in a solution (isotropic system) can be predicted. For a radical having M equivalent nuclei, each with a spin of I, the number of EPR lines expected is 2MI + 1. As an example, the methyl radical, CH3, has three 1H nuclei, each with I = 1/2, and so the number of lines expected is 2MI + 1 = 2(3)(1/2) + 1 = 4, which is as observed. For a radical having M1 equivalent nuclei, each with a spin of I1, and a group of M2 equivalent nuclei, each with a spin of I2, the number of lines expected is (2M1I1 + 1) (2M2I2 + 1). As an example, the methoxymethyl radical, H2C(OCH3), has two equivalent 1H nuclei, each with I = 1/2 and three equivalent 1H nuclei each with I = 1/2, and so the number of lines expected is (2M1I1 + 1) (2M2I2 + 1) = [2(2)(1/2) + 1][2(3)(1/2) + 1] = 3×4 = 12, again as observed. The above can be extended to predict the number of lines for any number of nuclei. While it is easy to predict the number of lines a radical's EPR spectrum should show, the reverse problem, unraveling a complex multi-line EPR spectrum and assigning the various spacings to specific nuclei, is more difficult. In the oft-encountered case of I = 1/2 nuclei (e.g., 1H, 19F, 31P), the line intensities produced by a population of radicals, each possessing M equivalent nuclei, will follow Pascal's triangle. For example, the spectrum at the right shows that the three 1H nuclei of the CH3 radical give rise to 2MI + 1 = 2(3)(1/2) + 1 = 4 lines with a 1:3:3:1 ratio. The line spacing gives a hyperfine coupling constant of aH = 23 G for each of the three 1H nuclei. Note again that the lines in this spectrum are first derivatives of absorptions. As a second example, consider the methoxymethyl radical, H2C(OCH3). The two equivalent methyl hydrogens will give an overall 1:2:1 EPR pattern, each component of which is further split by the three methoxy hydrogens into a 1:3:3:1 pattern to give a total of 3×4 = 12 lines, a triplet of quartets. A simulation of the observed EPR spectrum is shown at the right and agrees with the 12-line prediction and the expected line intensities. Note that the smaller coupling constant (smaller line spacing) is due to the three methoxy hydrogens, while the larger coupling constant (line spacing) is from the two hydrogens bonded directly to the carbon atom bearing the unpaired electron. It is often the case that coupling constants decrease in size with distance from a radical's unpaired electron, but there are some notable exceptions, such as the ethyl radical (CH2CH3). Resonance linewidths are defined in terms of the magnetic induction B and its corresponding units, and are measured along the x axis of an EPR spectrum, from a line's center to a chosen reference point of the line. These defined widths are called halfwidths and possess some advantages: for asymmetric lines, values of left and right halfwidth can be given. The halfwidth is the distance measured from the line's center to the point in which absorption value has half of maximal absorption value in the center of resonance line. First inclination width is a distance from center of the line to the point of maximal absorption curve inclination. In practice, a full definition of linewidth is used. For symmetric lines, halfwidth , and full inclination width . For more details on this topic, see Pulsed electron paramagnetic resonance. The dynamics of electron spins are best studied with pulsed measurements. Microwave pulses typically 10–100 ns long are used to control the spins in the Bloch sphere. The spin–lattice relaxation time can be measured with an inversion recovery experiment. As with pulsed NMR, the Hahn echo is central to many pulsed EPR experiments. A Hahn echo decay experiment can be used to measure the dephasing time, as shown in the animation below. The size of the echo is recorded for different spacings of the two pulses. This reveals the decoherence, which is not refocused by the pulse. In simple cases, an exponential decay is measured, which is described by the time. Pulsed electron paramagnetic resonance could be advanced into electron nuclear double resonance spectroscopy (ENDOR), which utilizes waves in the radio frequencies. Since different nuclei with unpaired electrons respond to different wavelengths, radio frequencies are required at times. Since the results of the ENDOR gives the coupling resonance between the nuclei and the unpaired electron, the relationship between them can be determined. EPR/ESR spectroscopy is used in various branches of science, such as biology, chemistry and physics, for the detection and identification of free radicals and paramagnetic centers such as F-centers. EPR is a sensitive, specific method for studying both radicals formed in chemical reactions and the reactions themselves. For example, when ice (solid H2O) is decomposed by exposure to high-energy radiation, radicals such as H, OH, and HO2 are produced. Such radicals can be identified and studied by EPR. Organic and inorganic radicals can be detected in electrochemical systems and in materials exposed to UV light. In many cases, the reactions to make the radicals and the subsequent reactions of the radicals are of interest, while in other cases EPR is used to provide information on a radical's geometry and the orbital of the unpaired electron. EPR/ESR spectroscopy is also used in geology and archaeology as a dating tool. It can be applied to a wide range of materials such as carbonates, sulfates, phosphates, silica or other silicates. Miniaturisation of military radar technologies allowed the development of miniature microwave electronics as a spin-off by the California Institute of Technology. Since 2007 these sensors have been employed in miniaturized electron spin resonance spectrometers called Micro-ESR. The high cost, large size, and difficult maintenance of electron spin resonance spectrometers has limited their use to specialized research centers with highly trained personnel. Micro-ESR makes ESR feasible for nonspecialists to determine oxidation by directly measuring of free radicals. Applications include real-time monitoring of free radical containing asphaltenes in (crude) oils, biomedical R&D to measure oxidative stress, evaluation of the shelf life of food products. Medical and biological applications of EPR also exist. Although radicals are very reactive, and so do not normally occur in high concentrations in biology, special reagents have been developed to spin-label molecules of interest. These reagents are particularly useful in biological systems. Specially-designed nonreactive radical molecules can attach to specific sites in a biological cell, and EPR spectra can then give information on the environment of these so-called spin labels or spin probes. Spin-labeled fatty acids have been extensively used to study dynamic organisation of lipids in biological membranes, lipid-protein interactions and temperature of transition of gel to liquid crystalline phases. A type of dosimetry system has been designed for reference standards and routine use in medicine, based on EPR signals of radicals from irradiated polycrystalline α-alanine (the alanine deamination radical, the hydrogen abstraction radical, and the (CO−(OH))=C(CH3)NH2+ radical) . This method is suitable for measuring gamma and x-rays, electrons, protons, and high-linear energy transfer (LET) radiation of doses in the 1 Gy to 100 kGy range. EPR/ESR spectroscopy can be applied only to systems in which the balance between radical decay and radical formation keeps the free radicals concentration above the detection limit of the spectrometer used. This can be a particularly severe problem in studying reactions in liquids. An alternative approach is to slow down reactions by studying samples held at cryogenic temperatures, such as 77 K (liquid nitrogen) or 4.2 K (liquid helium). An example of this work is the study of radical reactions in single crystals of amino acids exposed to x-rays, work that sometimes leads to activation energies and rate constants for radical reactions. The study of radiation-induced free radicals in biological substances (for cancer research) poses the additional problem that tissue contains water, and water (due to its electric dipole moment) has a strong absorption band in the microwave region used in EPR spectrometers. EPR/ESR also has been used by archaeologists for the dating of teeth. Radiation damage over long periods of time creates free radicals in tooth enamel, which can then be examined by EPR and, after proper calibration, dated. Alternatively, material extracted from the teeth of people during dental procedures can be used to quantify their cumulative exposure to ionizing radiation. People exposed to radiation from the Chernobyl disaster have been examined by this method. Radiation-sterilized foods have been examined with EPR spectroscopy, the aim being to develop methods to determine whether a particular food sample has been irradiated and to what dose. Because of its high sensitivity, EPR was used recently to measure the quantity of energy used locally during a mechanochemical milling process. EPR/ESR spectroscopy has been used to measure properties of crude oil, in particular asphaltene and vanadium content. EPR measurement of asphaltene content is a function of spin density and solvent polarity. Prior work dating to the 1960s has demonstrated the ability to measure vanadium content to sub-ppm levels. In the field of quantum computing, pulsed EPR is used to control the state of electron spin qubits in materials such as diamond, silicon and gallium arsenide. High-field high-frequency EPR measurements are sometimes needed to detect subtle spectroscopic details. However, for many years the use of electromagnets to produce the needed fields above 1.5 T was impossible, due principally to limitations of traditional magnet materials. The first multifunctional millimeter EPR spectrometer with a superconducting solenoid was described in the early 1970s by Prof. Y. S. Lebedev's group (Russian Institute of Chemical Physics, Moscow) in collaboration with L. G. Oranski's group (Ukrainian Physics and Technics Institute, Donetsk), which began working in the Institute of Problems of Chemical Physics, Chernogolovka around 1975. Two decades later, a W-band EPR spectrometer was produced as a small commercial line by the German Bruker Company, initiating the expansion of W-band EPR techniques into medium-sized academic laboratories. The EPR waveband is stipulated by the frequency or wavelength of a spectrometer's microwave source (see Table). EPR spectra of TEMPO, a nitroxide radical, as a function of frequency. Note the improvement in resolution from left to right. EPR spectra are simplified due to the reduction of second-order effects at high fields. Increase in orientation selectivity and sensitivity in the investigation of disordered systems. The informativity and precision of pulse methods, e.g., ENDOR also increase at high magnetic fields. Accessibility of spin systems with larger zero-field splitting due to the larger microwave quantum energy h .
The higher spectral resolution over g-factor, which increases with irradiation frequency and external magnetic field B0. This is used to investigate the structure, polarity, and dynamics of radical microenvironments in spin-modified organic and biological systems through the spin label and probe method. The figure shows how spectral resolution improves with increasing frequency. Saturation of paramagnetic centers occurs at a comparatively low microwave polarizing field B1, due to the exponential dependence of the number of excited spins on the radiation frequency . This effect can be successfully used to study the relaxation and dynamics of paramagnetic centers as well as of superslow motion in the systems under study. The cross-relaxation of paramagnetic centers decreases dramatically at high magnetic fields, making it easier to obtain more-precise and more-complete information about the system under study. ↑ Zavoisky, E. (1945). "Spin-magnetic resonance in paramagnetics". Fizicheskiĭ Zhurnal. 9: 211–245. ↑ Zavoisky, E. (1944). "Paramagnetic Absorption in Perpendicular and Parallel Fields for Salts, Solutions and Metals". PhD thesis. Kazan State University. ↑ Ira N. Levine (1975). Molecular Spectroscopy. Wiley & Sons, Inc. p. 380. ISBN 0-471-53128-6. ↑ Strictly speaking, "a" refers to the hyperfine splitting constant, a line spacing measured in magnetic field units, while A and B refer to hyperfine coupling constants measured in frequency units. Splitting and coupling constants are proportional, but not identical. The book by Wertz and Bolton has more information (pp. 46 and 442). Wertz, J. E., & Bolton, J. R. (1972). Electron spin resonance: Elementary theory and practical applications. New York: McGraw-Hill. ↑ Arthur Schweiger; Gunnar Jeschke (2001). Principles of Pulse Electron Paramagnetic Resonance. Oxford University Press. ISBN 978-0-19-850634-8. ↑ Ikeya, Motoji. New Applications of Electron Spin Resonance. doi:10.1142/1854. ↑ Yashroy, R. C. (1990). "Magnetic resonance studies of dynamic organisation of lipids in chloroplast membranes". Journal of Biosciences. 15 (4): 281. doi:10.1007/BF02702669. ↑ Yashroy, R. C. (1991). "Protein heat denaturation and study of membrane lipid-protein interactions by spin label ESR". Journal of Biochemical and Biophysical Methods. 22 (1): 55–9. doi:10.1016/0165-022X(91)90081-7. PMID 1848569. ↑ Yashroy, R. C. (1990). "Determination of membrane lipid phase transition temperature from 13C-NMR intensities". Journal of Biochemical and Biophysical Methods. 20 (4): 353–6. doi:10.1016/0165-022X(90)90097-V. PMID 2365951. ↑ "Dosimetry Systems". Journal of the ICRU. 8 (5): 29. 2008. doi:10.1093/jicru/ndn027. ↑ Gualtieri, G.; Colacicchia, S; Sgattonic, R.; Giannonic, M. (2001). "The Chernobyl Accident: EPR Dosimetry on Dental Enamel of Children". Applied Radiation and Isotopes. 55 (1): 71–79. doi:10.1016/S0969-8043(00)00351-1. PMID 11339534. ↑ Chumak, V.; Sholom, S.; Pasalskaya, L. (1999). "Application of High Precision EPR Dosimetry with Teeth for Reconstruction of Doses to Chernobyl Populations". Radiation Protection Dosimetry. 84: 515–520. doi:10.1093/oxfordjournals.rpd.a032790. ↑ Baron, M.; Chamayou, A.; Marchioro, L.; Raffi, J. (2005). "Radicalar probes to measure the action of energy on granular materials". Adv. Powder Technol. 16 (3): 199–212. doi:10.1163/1568552053750242. ↑ Krinichnyi, V.I. (1995) 2-mm Wave Band EPR Spectroscopy of Condensed Systems, CRC Press, Boca Raton, Fl. Wikimedia Commons has media related to Electron paramagnetic resonance.